I want to tell you a little secret. I really like it when people say nice things about me. 🙂 That’s one of the reasons I’ve enjoyed reading all the various RESP Book reviews, because they have all been pretty positive. But this RESP Book review by Krystal Yee, who writes at Gimme Back My Five Bucks as well as Moneyville.ca was super-nice. Not only is Mike Holman an amazing writer, but he was one of the bloggers I really looked up to when I first started my personal finance journey. And now, years later, I couldn’t be more excited to review his new book, The Complete Guide to Registered Education Savings Plans for Canadians. Mike makes learning about RESPs so easy. Unlike a lot of other financial guides which are dry and hard to understand, he writes in a clear, straight forward manner. This book is a fantastic guide for anyone interested in learning more about RESPs. Thanks so much, Krystal. Krystal is also holding a contest for a free book, so head on over and enter. 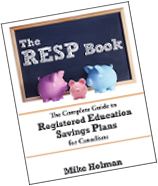 Here’s what you need to know: This is a very straight forward book on Registered Education Savings Plans and the information is solid. If you have kids and are interested in helping them out with funding their higher education: get the book. Don’t ask questions, just plunk down the $15.99 to Amazon.ca and get the book. In my opinion, you won’t regret it. Hey Mike, does your RESP book talk about (or do you have suggestions on) what to do if after someone opens up and funds the kids RESPs they later decide to move from Canada to the US? Can funds be used for foreign schools? Terminate the accounts? Roll over into RRSPs? Sprinkle some magic dust to transform them into ESAs? Hi Jordan. Long time no see! There is a chapter on residency. Bottom line is that RESPs are not very good if you are going to become a non-resident. Do you have a specific scenario you want me to cover? I remember when your blog used to hold some varied and useful information, that’s why I subscribed. Lately, almost EVERY SINGLE POST has been a plug for your book. Don’t get me wrong, it’s a good book, I purchased and enjoyed it. However, you are completely alienating your reader base! People want to read about stuff OTHER than reviews of your book. If someone isn’t interested in RESP’s or has already read your book, this blog has essentially become useless, which is sad because it used to be really good. I *almost* hit the unsubscribe button today… I swear to god, if the next post MENTIONS your book, you will lose a longtime and loyal reader.